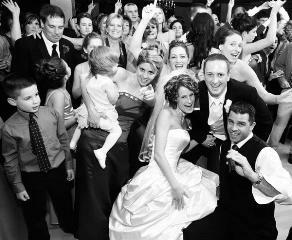 Specializing in unforgettably fun and creative wedding receptions! If the following describes your wedding reception dreams A smooth flowing evening full of emotional moments and most importantly FUN. Music selections that represent your tastes and help create the atmosphere you have always dreamed of. New imaginative ideas you and your guests have never heard of or seen before mixed with time tested tradition that leaves your guests amazed, impressed and saying "That was the best wedding reception ever". If your looking for someone who will help and listen. We take the time to meet with you and to plan out every detail of your event. This is how we personalize your reception. With your input and our expertise the night will unfold in a way that represents your tastes, personalities, and dreams while at the same time treating your guests to a unique and fun experience. If your looking for coordination. We use a team approach to create amazing wedding receptions. 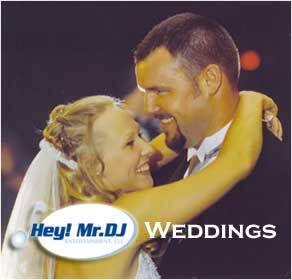 Your DJ will focus on the music, volume levels and reading the crowd. Your Master of Ceremonies (MC) will manage all the details and relay a wonderful personality while handling the announcements and the flow of the evening. At your reception, we want you to worry about nothing but having fun. Our MC is there to solve problems that may arise before you even know a problem exist s. Our MC will be your entertainment coordinator. If you want an expert in fun receptions. Wedding magazines will all tell you how to make your wedding beautiful. They'll explain what flowers work in what season and what colors are in. None of them tell you how to make your wedding reception FUN, UNIQUE and AMAZING. That is exactly where we come in. We love wedding receptions. We spend countless hours researching new ideas through networking groups of entertainers, coordinators, professional speakers and other wedding vendors. Every reception should be unique and not the same cookie cutter event your guests have been to for the last 25 years.